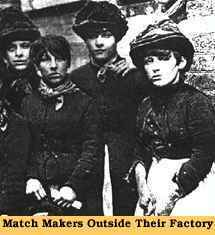 The Industrial Revolution in part was fueled by the economic necessity of many women, single and married, to find waged work outside their home. Women mostly found jobs in domestic service, textile factories, and piece work shops. They also worked in the coal mines. For some, the Industrial Revolution provided independent wages, mobility and a better standard of living. For the majority, however, factory work in the early years of the 19th century resulted in a life of hardship. Working conditions were often unsanitary and the work dangerous. Education suffered because of the demands of work. Home life suffered as women were faced with the double burden of factory work followed by domestic chores and child care. Men assumed supervisory roles over women and received higher wages. Unsupervised young women away from home generated societal fears over their fate. There was some worker opposition to proposals that child and female labor should be abolished from certain jobs. 2) Illustrations of women and children in the mines. 2) Song: "The Distressed Seamstress"
For resource information and help in answering some of the questions, CLICK HERE.